Working from home is an attainable goal for many people. Starting a home cleaning business is one of the best options for those who are looking for a stable income flow, either part-time or full-time. Cleaning for a living is an excellent choice for people with limited resources to get into a business, due to the low cost of starting up. For those with little or no formal education, a part-time service is easy to manage, and can provide an income stream while pursuing a college degree or otherwise furthering an education. 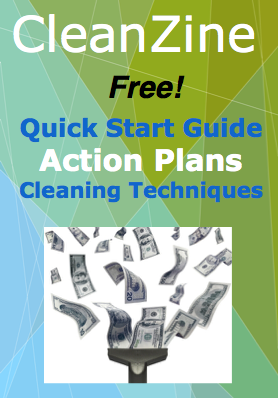 If you want to start up a housecleaning business, first examine your goals. Setting a tangible financial goal is helpful during the setup phase. Some people find it useful to set a specific amount (for example, $75,000), as their ideal annual-earnings goal. Others find it more helpful to set a specific goal of earnings they will use to pay off a load of debt. Some may set a goal of earnings that will pay for a family vacation, or a new car. The point is to keep your attention focused on making your goals a reality. So, take action toward them every day. This may require some inner-searching, and career coaches suggest that when starting up a business, it is helpful to take stock of your expectations as well as your skills. Take a mental and emotional inventory, and find the key that will motivate you to reach your goals. Once your goals are clarified, it's time to take action. The first step of the journey is very important. It sets the tone and points you in the right direction. But there are actually several items on a startup's “to do” list. How do you know which step to take first? You need an objective perspective. One of the best ways to get an outside opinion is to find a mentor who has worked in your field. The business coach or mentor can guide you on that very step. What's more, they can warn you about the potholes in the road ahead, and steer you in the direction of your end-goals. Starting a home cleaning service is not brain surgery, but if you go about it right from the start, you can be bringing in a truckload of money in a short amount of time. As with any new endeavor, it is easy to get excited about starting up a cleaning business, because short-term work is fairly easy to find. This is especially true if you are enthusiastic, as your customers will respond positively to you. The question is whether you can manage it well enough to work for the long term, and can it grow into a relatively large enough company for you to live on? The answer, definitively, is yes! That is, making a good living with your cleaning business is an achievable goal, as long as you put into place a few smart, stabilizing systems. The sooner you put these systems into place, the better the outlook for your business. As it grows, your business will become more complex in every way. If you have implemented structures capable of bearing that complexity, it will survive and grow. Your confidence in the business and in yourself as a business owner will magnify. The problem for many people is that they do not give much consideration to their business systems. They expect their company to scale-up in size, naturally, without having bothered to lay down the scaffold or structure to enable that growth. Smart systems can save your business right from the start. Working from home is indeed an attainable goal, and if you like to keep things tidy and orderly, starting a home cleaning service is one of the easiest and quickest businesses to set up.